Emerging technologies that could transform the defensive or offensive edge of a nation are protected by secrecy, denial, and deception. These disruptive capability gains do not follow conventional paths nor an established pattern of adoption. Averting dual-use emerging technologies could radically affect strategic and tactical deterrence of the USA against state and non-state actors pursuing biological weapons. The convergence of artificial intelligence, genomics, Big Data, and nanotechnology is at the center of the biodefense discussion today. Different DNA sequencing and nanosensor technologies capture trillions of bytes of information, which coupled with artificial intelligence could play a key role to avert and counter known and unknown pathogens. Despite the technological progress, biodefense stakeholders still lack access to an analytical enterprise that improves near real-time pathogen outbreak awareness at the global scale and can provide strategic and tactical risk assessment to minimize the impact of biothreats on human, animal, and plants. This chapter discusses how Big Data and artificial intelligence can be used to process genomic information and unstructured qualitative and quantitative datasets to support human-machine teaming for sense, shape, shield, and sustain in multidomain biodefense environment. The implications of this framework are also summarized. I am grateful to Drs. Juergen Richt and Romelito Lapitan for the insightful discussions and suggestions that improved this manuscript. 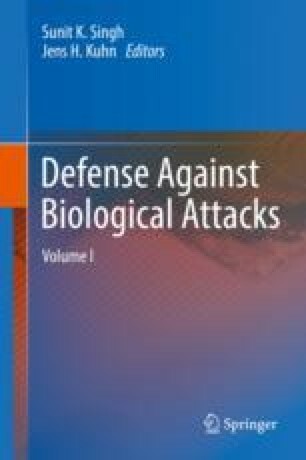 The research associated with this book chapter was partially funded by the Department of Homeland Security Center of Excellence for Emerging and Zoonotic Animal Disease (CEEZAD), the Kansas Bioscience Authority, the Defense Threat Reduction Agency (DTRA) Biological Engagement Program, and the Department of Homeland Customs and Border Protection Office Ag/Bio-Terror Countermeasures (ABTC).